Robert McWilliams was born in Glasgow, Scotland, but moved with his journalist father’s job to the south of England at the age of three. Rob graduated from Wadham College, Oxford, with a BA Hons. in Modern History. After university, he worked as a tour guide and English teacher in France and Spain, before joining Reuters news agency in London. Rob spent 16 years at Reuters as a business manager in Hong Kong, Japan, the US, Venezuela and Brazil. For nearly 20 years, Rob has lived in Connecticut with his wife and daughters, and is now a US citizen. Tired of corporate life, he quit his job to fulfill a stubborn ambition to walk the length of Scotland. He has contributed the Taking a Hike column to local newspapers every month for five years. Taking a Hike placed second in the general column category of the 2017 Connecticut Press Club awards. 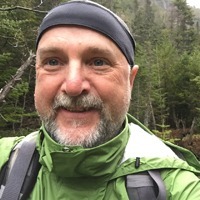 Rob has also written for A.T. Journeys, the official magazine of the Appalachian Trail, and Ctvisit.com. 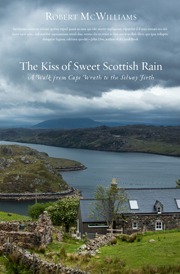 The Kiss of Sweet Scottish Rain is his first book. Rob enjoys hiking, and travel off the beaten track. He does consulting work on information privacy, and volunteers with the Nature Conservancy, Appalachian Trail and other outdoor causes.